British campaigners and politicians on both sides of the debate over the UK’s membership of the EU today were swift to cite the Brussels terror attacks as evidence to support their points of view on the Brexit referendum. Central to the arguments were the Schengen passport-free travel zone, its possible security implications, and whether EU membership made Britons more or less safe. Four British nationals were injured in the attack and, at time of writing, one Briton is missing. After the bombings, border controls were reinstated in the Netherlands, Belgium and France. The arguments were given added impetus by the backdrop of the ongoing migration crisis, which has been linked to terrorism and has pushed Schengen to its limits. 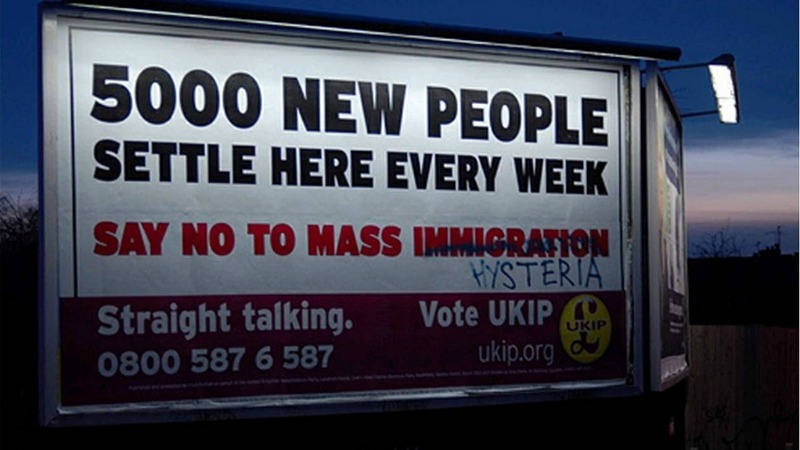 Immigration and control of borders is also one of the key issues of the Brexit debate. Bookmakers in the UK, which is not a member of Schengen, have narrowed the odds on Brexit in the wake of the attacks. Denis MacShane, was Tony Blair’s Europe Minister and has written a book on Brexit. He told EURACTIV, “Predictably the Brexit crowd are out trying to use the Brussels atrocity as a reason for Brexit and to denounce Schengen. “At least with the European Arrest Warrant the UK could get one of the terrorists returned to Britain from Rome,” he added. Peter Wilding of pro-EU campaign group British Influence said, “Immigration cannot be used to dog-whistle prejudice in order to hasten Brexit. “Brits are bigger than that. And the issue of EU membership is wider and more historic. This is a once in a lifetime decision. The European Commission today (23 March) said that the attacks proved the need for cooperation of national intelligence agencies through EU structures. Commission President Jean-Claude Junker called for the creation of a “Security Union” in a joint press conference with French Minister Manuel Valls. France was also victim to a shocking terrorist outrage in November as well as the Charlie Hebdo massacre. British Commissioner Jonathan Hill tweeted it was important to keep the Schengen and terrorism issues separate in any debate. Leading politicians Theresa May, the Conservative Home Secretary, and Andy Burnham, her Labour shadow, both supported that view in a debate in the House of Commons. British police are embedded with Belgian authorities, it was revealed, and helped in the hunt for Salah Abdeslam, who was arrested by cops last week. In an interview with The Times published on the day of the attacks, Conservative Home Secretary Theresa May said that “the EU brought added security”. “There are things we can do as members of the European Union in terms of the exchange of information and data, but also working together within the EU that is of benefit in terms of catching criminals,” she said. Howard, a former home secretary, claimed he had written the speech before the attacks. After yesterday’s bombings the Eurosceptic UK Independence Party sent a press release blaming the attack on the Schengen visa-free travel soon. The missive drew a flurry of criticism on social media, culminating in British Prime Minister David Cameron branding it “not appropriate”. Nigel Farage, UKIP’s leader, was criticised for retweeting this tweet by Telegraph journalist Alison Pearson. Denis MacShane said, “Like Donald Trump’s stupid remarks on Muslims, the Brexiteers in Britain will go as low as possible to exploit a tragedy like Brussels to justify leaving Europe. The terrorist attacks in Brussels brought tales of carnage, confusion and courage, as the Belgian capital struggled to cope with the unfolding tragedy that left at least 34 dead. 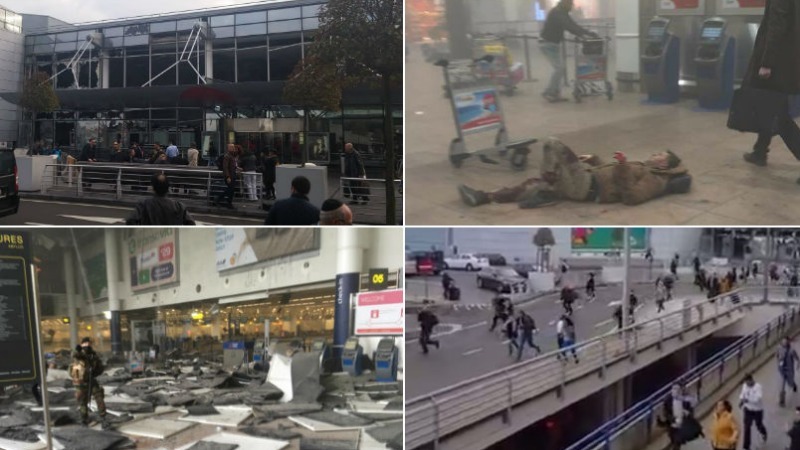 The morning after the twin attacks on Brussels’ airport and metro station, the death toll stands at 32 confirmed dead, with up to 270 injured. According to Belgian Prosecutor Frederic Van Leeuw, two brothers, Khalid and Brahim El Bakraoui, already known to the police, attacked the metro and the airport respectively. Police overnight issued photos of a third man, now believed to be on the run, from the suicide bombing at Zaventem airport. Local media have name him as Najim Laachraoui. Earlier tabloid reports he had been captured were retracted. The first victim of the attacks has been named – Adelma Tapia Ruiz, a 36-year old Peruvian woman who died at the airport. Names of other victims and some of the pictured survivors have also emerged during the day. 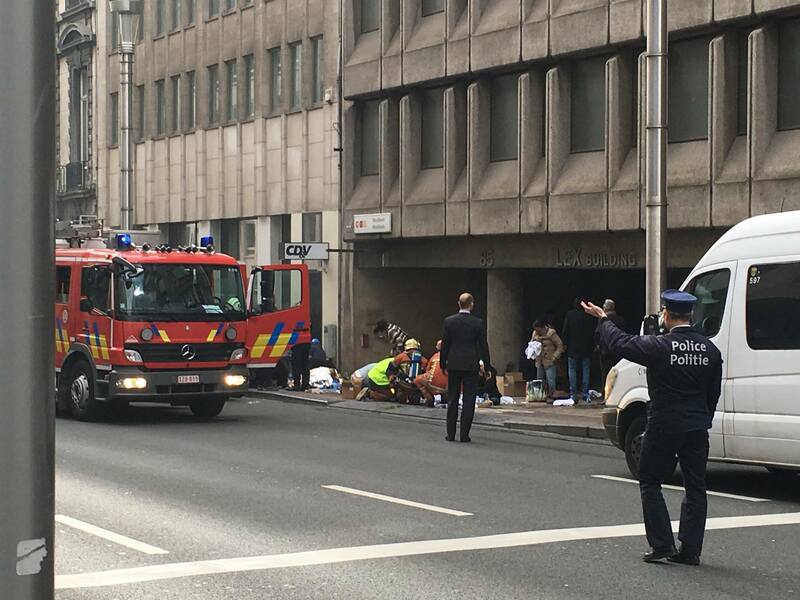 Belgian police have carried out overnight raids, including one in Schaarbeek which uncovered an Isis flag and nail bomb. King Philippe addressed the country on television last night, calling the attacks “cowardly”. Some buses are running in the Belgian capital, and Metro lines 2 and 6 were due to restart. Belgium begins three days of national mourning. 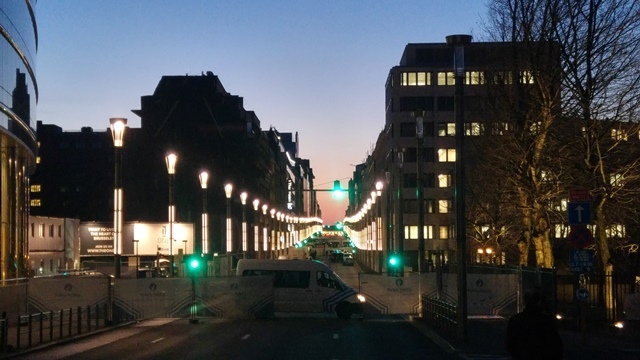 Three EU Commission officials have been injured, whilst the DG Agriculture building is closed and being examined for structural damage after the Maelbeek metro blast. The Nations of Continental Europe are committing suicide by EU stupidity and they seem almost happy to be doing it. We really have to leave the barking mad EU. Terrorists can freely travel from London to Glasgow! Scandal! And from Belfast to London! Or from Marseilles to Paris! Let’s raise the border! Seriously, if you call for borders being lifted between Brussels and Paris, why not between Belfast and London or between Marseilles and Paris? Or between one suburb of Brussels and another suburb of Brussels? What about dividing Belgium into 3 separate states? Each with border control…. More borders more security? Do you think that wasting thousands of policemen on 24/7 duty around all borders giving stamps to passport will enhance Belgian security? why do we have doors and locks… its to keep the wolves and the thieves out… same rule for borders.